The Wine Guy: Kilikanoon Wines named James Halliday Winery of the Year! 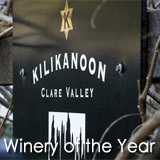 Kilikanoon Wines named James Halliday Winery of the Year! Kilikanoon Wines has recently been named - James Halliday Winery of the Year in the newly released 2013 edition of his ‘Australian Wine Companion’. I have been working with Kilikanoon for a number of years, enjoying the depth of character, ripe, early approachable nature of their wines - and have reviewed on my wine-blog, Kevin’s - Killerman’s Run Shiraz over several vintages, for these very reasons. As soon as I heard the news - I opened a bottle of Kevin’s - Kilikanoon 'Block’s Road' Cabernet 2009 and raised a glass - for a well deserved acknowledgment for everyone’s hard work and attention to detail with all aspects of their business. The winery was established back in 1997 by Kevin Mitchell, with grapes sourced from the two vineyards owned by Kevin and his father Mort, with a focus on crafting wines with a strong regional and varietal honesty and definition. James Halliday, author of the ‘Wine Companion’ and one of Australia’s most respected wine judges said “Kilikanoon has travelled in the fast lane since its establishment in 1997, gaining 5-star status in the 2004 Wine Companion, five red stars in the 2008, moving to the ultimate red star/red name in 2012. This placed it among the best 100 wineries in Australia, yet this year (2013) it surpassed its prior history with 12 of its wines receiving 94 points or above”. “This is fantastic news for our brand after many years of hard work and very humbling as a winemaker.’ said Winemaker Kevin Mitchell. “It has always been our intention to showcase the unique regional terroir that we all live and work with especially those from our single vineyard sites that form much of our portfolio. We are extremely fortunate to have access to some superb vineyards and it is these resources that make the crafting of high-end wines easier. We are thrilled. This announcement is not only an achievement for Kilikanoon but testament to what is possible in the Clare Valley with eleven Clare wines - Shiraz, Riesling, Cabernet, Grenache and Semillon - rated 92 points or above”. “I couldn’t help myself from venturing south to make Shiraz from both the Barossa Valley and McLaren Vale. That move has been vindicated with Barossa ‘R’ Reserve rated 96 points and McLaren ‘M’ Reserve rated 95 points. 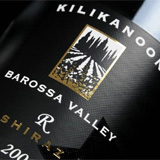 Kilikanoon has become a world recognised Shiraz specialist”. Said Kevin Mitchell. In its relatively short history Kilikanoon has won a large number of Australian and International awards and received high praise from the world’s most respected wine writers. 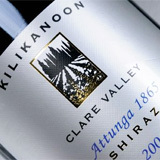 The 2002 Clare Valley Wine Show really put Kilikanoon on the map, when they took home six of the seven trophies. Since that time the winery has gone from strength to strength taking home a number of awards including the San Francisco International Wine Competitions, Best of Nation Trophy (2010), and receiving comments such as “This is one of the most brilliantly run wineries in Australia” from Robert Parker Jnr’s Wine Advocate. Kilikanoon this year has 17 wines scoring above 92 points in the ‘Wine Companion’.